The exterior of four Moray primary schools currently undergoing major refurbishment will match the colour of pupils’ uniforms. Sections of the external walls at Millbank in Buckie, Applegrove in Forres, Seafield in Elgin and St Gerardine in Lossiemouth will be rendered in the school colours. Work is well under way on the £17million project which will see major improvements at all four schools. The refurbishment – which will continue until spring 2017 – is designed to bring the condition of the schools up to a standard that will be fit for the purpose of delivering education to pupils in the 21st century. The work is being funded with the help of a £10million grant from the Scottish Government, with Moray Council providing the rest of the funding. Improvement works will include new roof coverings, windows and doors, external insulation and completely modernised heating and electrical systems. There will be a reconfiguration of the interior of the schools which will include a mixture of new and refurbished classroom accommodation. School colours – already incorporated in pupils’ uniforms - will also be reflected in the external rendering. In Millbank’s case, that will be burgundy, at Applegrove it will be green, at Seafield purple and at St Gerardine red. 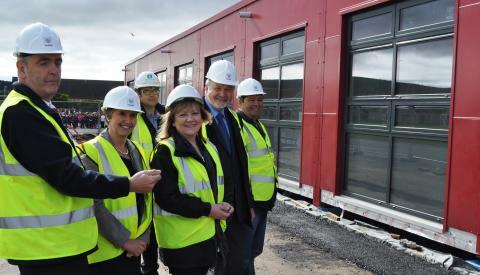 At Millbank, local councillors saw work in progress during a familiarisation visit last week when they were shown round new colour co-ordinated modular classrooms which are also finished in the school’s burgundy livery. They were accompanied by Moray Council’s head of lifelong learning, culture and sport, Graham Jarvis, who said all four schools could look forward to a vastly improved environment for teaching and learning once the work was completed. “It has been proved that the physical environment in which children and staff learn and teach can have a very positive effect on attainment and behaviour,” he said.